Consumer reports have continuously found that consumers (just like you and me) prefer the recommendations of their peers instead of other advertising means. Why? Because it’s (for the most part) unbiased and since these friends and colleagues know you well, you assume they would know what you like and have your best interests at heart. Yes, word of mouth marketing is alive and well, and will continue to thrive. Start monitoring, join the conversation, and some shameless self-promotion never hurts either. Twitter is particularly handy because it’s short and it’s RIGHT now. Lots of twitter users are looking for suggestions on where to go or watching where other users are going. Twitter can be a great venue for the customer satisfaction pulse. If someone has an issue, it’s great to provide on the spot customer service, and this can create amazing brand loyalty. Also, what a great way to help loyal customers (your Twitter followers) know about menu updates, specials or just how much you love them. These great sites will help you keep up on what people are really saying about your establishment. Don’t ignore these reviews. Sure, you can’t please everyone, but if you’re looking for suggestions on how to improve your service, look no further than these treasure troves of great info. Tip: Don’t be afraid of the occasional nasty/rude review. These bad apples make the rest of the great reviews more genuine. Sometimes you’ll even get a loyalist on your side that will discount those mean mentions. Also, many review sites have iPhone applications, so going mobile is a snap and free to you. Get yourself listed! With Google Maps it’s free to list your business and may be more helpful than you may think. Let me tell you why. Google is the number one search engine and is moving forward with blended search results (particularly local). This means it’s more likely a map result will get precedence over other content. Want to be on the first page? This is a good way to do it! Also, Google Maps is a leading service in mobile mapping technology, so if someone is looking for a good place to eat while they’re out and about, you’ll show up! Also, Google will aggregate most review sites and average those reviews, making it really easy for consumers to get the scoop on your delicious venue. Looking to promote a particular event at your establishment? Broadcasting it on local-based event sites is a great way to get visitors that didn’t even know you existed before. Also, look to partner with groups that may need venue suggestions. If you have a particularly slow night (say Tuesdays), offer them up a great deal (maybe happy hour prices) to host their group. This is a great way to start brand loyalty with new faces. Got a camera? Take some shots of your famous menu items to share with fans and people that might be interested in learning more about your restaurant. This will help people get a better understanding of portions, how delicious your food is, etc. Also, there’s a great chance these photos will show up in blended search results! Got a video camera? Even better! Take a video tour of “behind-the-scenes” to give guests a unique experience on what goes into creating the amazing dishes you offer. This can really create buzz and be a nice personalized touch, especially if you already have fanatical brand loyalists. Hope your mouth is watering with all these delicious new marketing opportunities that online relationships offer. Now that you’ve had a taste, how do you think you could harness this new trend to get more patrons? Originally written for On Our Minds – Santy Integrated’s blog. I presented at AIGA Arizona Say Anything on November 10th. Here is the write up of the talk based on the slides that were presented that evening. I hope everyone got something out of this presentation and please feel free to post comments regarding questions you may have on this material. 🙂 Thank you to AIGA Arizona for the opportunity to present and I hope to be back real soon. Step 1: What is Web Design? Wow, lots to digest there, let’s break it up a bit. The creation of digital environments that facilitate and encourage human activity. So basically all this is saying that web design is design within a digital space (i.e. the web) but more importantly that it’s main purpose is to facilitate and encourage human activity. We want to interact with them, give and get from the user. This allows for a special kind of communication that we haven’t ever seen from media before. Instead of dictating to the consumer, we can now receive and act on information provided to us, very powerful. Reflect or adapt to the individual voices and content. While the web is still a relatively new media format in the grand scheme of media and advertising, it’s still very customizable. We should harness this adaptability and use it to the best of our abilities to reflect and present the content in a very specialized manner. The web was created for the purpose of collecting and sharing information; web design cannot forget these roots as we move forward. Content is king, it’s the most important part, and should be treated that way. Change gracefully over time while always retaining its identity. Web design is unlike many other forms of media because of the way it can be changed over time. Unlike print, we can continue to add, take away and mold this space over and over again. The tricky part is doing it gracefully and staying true to the original brand and statement. If we change too often or off course of our brand in can alienate our users instead of creating those core connections and communications levels we would like to have. Overall, web design is very similar to other types of design; there are still guidelines, best practices, and techniques that separate good design from the bad. Also, just like all other types of media, it’s centered on communication, however there is a new addition that makes this a new frontier, the interactivity of the users who use it. Now that we know our adversary, let’s delve into those guidelines, best practices and techniques that will allow you to be empowered to go head first into the fight. Step 2: Knowledge is Power. The more you know about why and what you’re designing for the web will help you in your quest. What’s the real reason behind why the design needs to be created? Perhaps it’s to share product information or to be able to process online orders. What ever it is, nail it down and keep it simple. Even if there are a few reasons, keep them concise and in front of you at all times. This will help you stave off the needs for the “wouldn’t it be nice if?” scope creep that can really get you in trouble later. Define your users and what they need. Who are your users? What do they want from you? More often than not they won’t need a sales pitch, they’re qualified leads or else they wouldn’t be there. So veer away from the extended sales pitch and instead focus on giving your users the information they need & want about your services or products. Need help figuring out what your users want the most? Check out your current google analytics statics to see what your users are looking for the most, or check out a heat mapping service such as Crazy Egg that will help you visualize what your users are looking for and clicking on. Communicate to develop correct functionality scope. Talk with your client, project manager, and development team to come up with a correct scope of functionality. When the client signs off on designs, often they’re not only signing off on look and feel but functional items such as searches, drop downs, user functionality, etc. Make sure that everything that’s depicted within the comps is with in functionality scope and doable. This is a tough one to accomplish, but stick in there and this one will pay off! More often than not timelines slip because the client doesn’t realize the scope of content needed to complete a web project. When you focus on getting these items right off the bat it allows the client to become more of an active participant in the planning and will help them understand how much work is involved in the design and development process. It will also keep them busy so they’re not prodding for more features or badgering you about deliverables sooner than the timeline suggests. Collecting all the content also helps you plan out an accurate site information architecture and will help you design with the voice and content already in place. Step 3: Organize for the user. Once you’ve got all your parts and pieces remember to organize them keeping the users and their needs in the forefront at all times. Knowing more about usability will help you out here, so check out this definition from Jakob Nielsen. Usability: the users perception of how consistent, intuitive, and organized it is to accomplish tasks within a system. Offer the user clear choices. Don’t overload the user with options, stick to the purposes and users needs that you had outlined earlier. Keep it clear, easy to understand, and if you can make it so easy that the user feels like a GENIUS because it was so easy to use. Use conventional terms, icons and positioning. Sure we all want to create something new and fun, but try to stick with the normal terms, icons, and placement on standard web stuff. Such as don’t replace the e-mail envelope with the @ symbol, it will require your users to think, and to break that stream of consciousness enables poor usability. However, just because you should stick with the standards doesn’t mean you can’t bend the rules, you just have to do it in such a easy way that it can be picked up with minimal effort. Most users scan the page in a F-Shaped eye tracking, so you most likely want to place your most important pieces within this pathing. Avoid large / lengthy blocks of content if possible. Most web users tend to scan content vs. read it fully so keep it short and concise. If you want to overview content, stick to three to five bullet points with links that go to the full content for those who are interested. Remember for every link you create in your design there must be somewhere that goes to. Remember standard user flows like what are the steps/process when a user registers, signs in, or tries to buy a product? Remembering these steps as you design will help you comprehend the whole flow and layout of the website as a whole. If you would like help with some of these steps, check out a handy service called Product Planner. Wireframes are your friends, you can’t have to many. Wireframes can help considerably when you’re still planning out the placement of major items and user flows, they’re less time consuming and can be really amazing tools when trying to understand what should be the most important elements within a page. Step 4: Roll up your sleeves. Alright, with all that collecting and planning I guess you should be ready to actually design something right? Check out some of these tips to make your design to implementation time shorter. Too many images means it will take too long to load, while it loads it will look like crap. So, be smart and use the less is more approach. Also, all those images won’t have the search engine weight as text would have, so remember that when choosing typefaces as images, etc. If you REALLY want to use a non-standard font face, check out sIFR for your implementation, but a few notes on this, sIFR uses flash to render the font so it will still impede load time. It will be SEO compliant, but it will also require flash. Images can be an accessibility nightmare, if seriously informational text is included in graphics it needs to be in full text as the alt attribute for the image. Instead of having to remember all this, using a regular font and HTML text would be a better decision. Organize your PSD to have all elements grouped together by area such as header, footers, callouts, etc this will make selecting and merging for cutting easier later. Include on and over states for navigation, since this is an interactive space these styles will need to included so that they can be implemented later. Keep all your layers editable, you never know when you’ll need to change a piece of text or a background color later, instead of redoing the entire PSD, just be smart and don’t merge layers. Even though you’ve focused on the users during the gathering and planning processes, you can’t forget about them now. Through out design iterations it’s easy to forget about the end user in hopes to quell the client, keep in mind that this website isn’t for your client to use, its for their customers, so they’re most important. I’ve left my position at Terralever as a front end architect to explore other opportunities within the Phoenix area. Over the last few months I’ve developed an interest in other aspects of the web industry, not just xhtml/css. I’d like to expand my abilities in areas such as web marketing strategy, seo/sem, design and other areas in web design and development. Terralever is a great company that provided me with spectacular opportunities to work with big name brands and cutting edge technology. However, each employee is very specialized and a very T shaped professional, while this position allowed me to become very specialized in XHTML/CSS, I didn’t find the flexibility I required to delve into other areas I was interested in. I have accepted a short term contract with Drawbackwards, a smaller strategic design and interactive marketing agency. I will be filling several roles at Drawbackwards that will enable me to have the flexibility to explore the other areas of the web industry that I’m interested in. Over the last week I’ve been able to create information architecture, SEO/SEM suggestions, project plans, etc. I’m sure this is just the beginning. I’ve realized that I’m interested in more than just how the web is created. I want to know how people make the web great. Focusing on strategic approaches to connect great companies and services with customers and users whose lives will be enriched by these products, services and relationships. Adaptive Path Employees share their new years resolutions with their users. Some of them are very much work related, some not so much, but I thought it would be interesting to see what other web professionals are reflecting on at the beginning of this year. This amazing Honda Accord ad required 606 takes, cost $6 million dollars, and took 3 months to complete. Pretty decent CSS cheat sheet for those of you who want to learn more about the production wonders of the world. 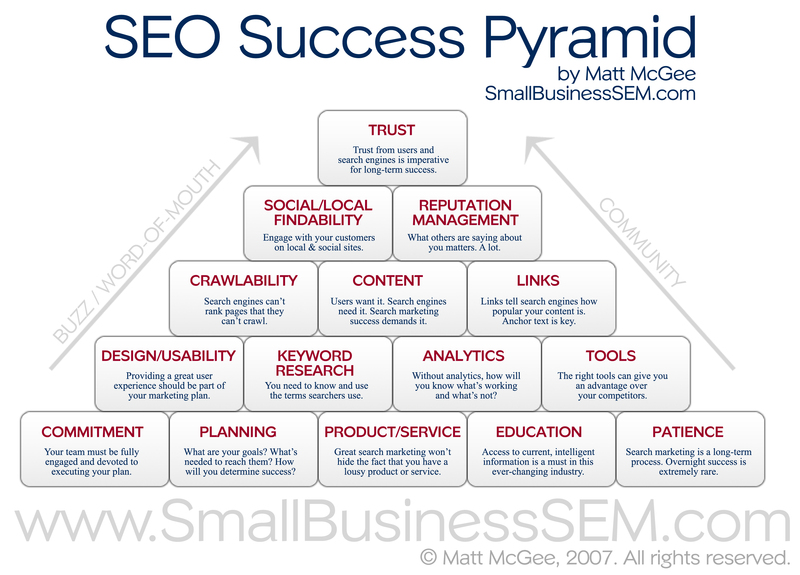 Interesting SEO Success Pyramid graphic that highlights some of the key requirements of great SEO success. “How many five year olds could you take on in a fight?” Enter your stats and find out how many five year olds it would take to take you down! We have recently hired on a GENIUS of a woman named Kay at work. She does all our SEO implimentation and organic keyword creation, etc. Basically, if you want to be in the top 10 on Google, she can make it happen. While Terralever has always been a results driven company, Kay is amazing in the amount of information she provides clients regarding SEO and organic keyword trafficing. So, being inspired by her wisdom, I’ve sat down this evening and added the All in One SEO Pack for WordPress allowing me to customize my post meta keywords and description. To track my success, I’ve also bought into Mint and installed it on my server so I can see EVERY little move you make my dear visitor… scary eh? I’ll let you know my progress as I track my way into being a WORLD FAMOUS web guru. hehe Alright, maybe not, but at least I can send Christmas e-mails out to all of my seven visitors!